Contents: J.S. Bruner, M.H. Bornstein, On Interaction. Part I:Interaction in Cognitive Development. J. Tudge, B. Rogoff, Peer Influences on Cognitive Development: Piagetian and Vygotskian Perspectives. 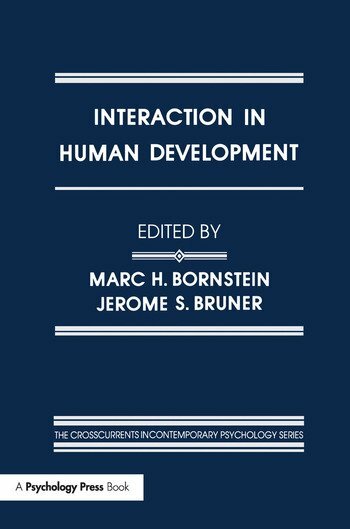 M. Bovet, S. ParratDayan, J. Voneche, Cognitive Development and Interaction. D. Wood, Social Interaction as Tutoring. Part II:Interaction in Language Acquisition C.E. Snow, Understanding Social Interaction and Language Acquisition: Sentences Are Not Enough. S. Curtiss, The Independence and Task-Specificity of Language. E.A. Schegloff, Reflections on Language, Development, and the Interactional Character of Talk-in-lnteraction. Part III:Child-Caretaker Interaction. C.S. Bergeman, R. Plomin, Genotype-Environmental Interaction. F.F. Strayer, E. Moss, The Co-Construction of Representational Activity During Social Interaction. M.H. Bornstein, Between Caretakers and Their Young: Two Modes of Interaction and Their Consequences for Cognitive Growth. Part IV:How to Formulate the Interaction Problem? R.M. Lerner, Developmental Contextualism and the Life-Span View of Person-Context Interaction. R. Bakeman, L.B . Adamson, P. Strisik, Lags and Logs: Statistical Approaches to Interaction C.J.Lumsden, The Gene-Culture Connection: Interaction Across Levels of Analysis. "This may be the most stimulating and significant volume yet to appear in the 'Cross currents in Contemporary Psychology' series; it is a critically important addition to this series, and a valuable supplement to the "Life-Span Developmental Psychology" series....Highly recommended for upper-division undergraduates." "This book is intended for advanced developmentalists and would make an excellent text for a graduate seminar."